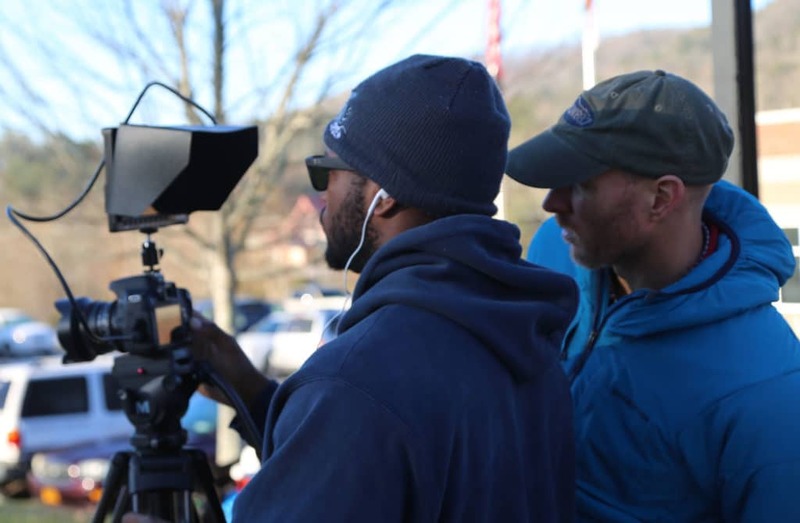 Brevard College has an exciting new class that takes students out of the classroom and puts them on set. A Special Topics Seminar, the class focuses on Public Service Announcement (PSA) creation. It is Brevard’s first step into the world of film production classes. It began with a need. Both the Brevard and Mint Hill Police Departments came to Criminal Justice professor Tim Powers with the need for a PSA about public contact with law enforcement officers. Powers, knowing the vast resources and talent at Brevard College, sought out Theatre professor Brandon Smith. The two departments worked together with students to create the PSA and from there, an interest was sparked. “After recognizing some common ground between our fields of study, and an area of demand in the marketplace, we began imagining how we might be able to make the course available to students.” Said Smith, about the origins of the class. Powers went out in the community and gathered local grants to help fund the developing course. Part of these funds went toward the equipment. The class is working primarily with two Canon digital SLR cameras, a variety of cinematic lenses, and 1k lights. 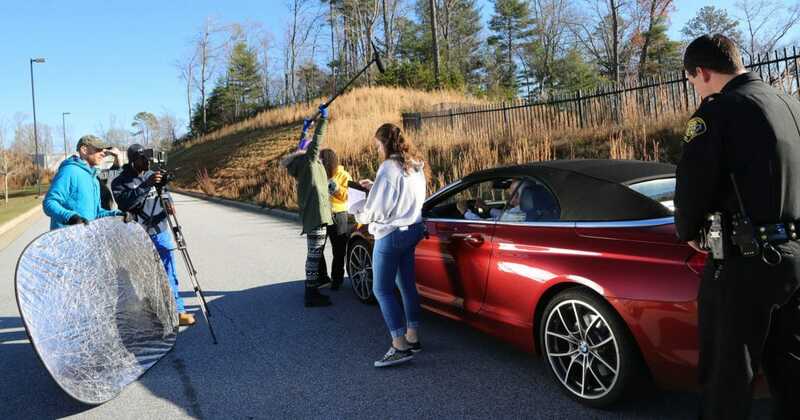 With the ability to get hands-on experience, students are learning various skills and roles specific to film production. “This class allows the students to interact with the local community members and law enforcement officers which they use as participants in their PSAs.” Said Powers, coordinator of the Criminal Justice program. In keeping with Brevard’s motto “Learn in order to serve,” the class offers the opportunity for students to work closely not only with members of the community and local law enforcement but with one another as well. Among the 10 students enrolled, you’ll find a unique combination of two unlikely departments working together: Criminal Justice and Theatre. Despite their different majors, students shared common goals and were able to use one another’s interests to successfully complete assignments. Their current assignment involves creating a 60 second PSA on how to conduct yourself during a traffic stop. To kick off the project, Police Chief Harris and Brevard College alumni Sheriff Mahoney spoke to the class on correct procedures and expectations, as well as their individual hopes for the video. “My goal is to get students thinking in a creative way, to get them in a mindset of having a message to deliver and using video to deliver it in the most effective way,” said T.C Webb, the adjunct professor for the class. That goal was clearly set for the first assignment. Students were tasked with creating a “Self Portrait Video” that would introduce who they were as storytellers to the rest of the class. On all assignments, an emphasis is placed on what story the video tells, whether it lasts for two hours or 60 seconds. The overall approach to the class is to learn by doing. When first introducing the cinema lenses, Professor Webb gave a brief overview of how lenses work and different techniques used with them, then allowed students to practice with the various lenses available. “My favorite thing about the class is seeing an idea actually come together and be turned into a product that many people will be able to view. I think that’s pretty cool.” said Becky Harris, a sophomore studying criminal justice. For their first PSA, students were given a theme: “Underage Drinking.” Each student then came to class with a presentation of their idea. Two concepts were picked by the class to be developed further, and the students were split into two groups. The groups were responsible for creating a script, scheduling shooting days, gathering/making props, contacting actors or outside help, and other tasks. Students not only learned how to be an efficient, well-communicated team but also learned valuable skills related to film production. “The market and application of skills related to film production are significant, and growing by the day with online content moving heavily to video,” Smith said. Whether it be creating or consuming, videos play a major role in society today. Training students on how to participate in and contribute to this market is an important part of preparing them for a future career in a wide range of areas. Brevard College is consistently making efforts to prepare all students for a bright future in whatever they are passionate about, and the PSA class is a prime example of that.